According to his bio, Sudeep Rangi was born on the Louisiana bayou – a big-bearded, bow-tie wearing, bourbon slinging, bike riding, coffee and wine swilling Parisian dweller, who otherwise ruminates on bioethics under the auspices of UNESCO during the day. We caught up with him to find out why he loves his neighbourhood! 1. Why did you move to this area and what do you like about it? It’s location and my idealism. There’s no doubt from the moment I wake up and look up at the moulding on my ceiling to standing up and looking down the avenue that I’m in this iconic Parisian halcyon. The route I cycle to work, along with my requisite breakfast and cortado stop at Coutume Cafe, going past Invalides straight to the Eiffel Tower. It’s lovely…and takes less than 15 minutes. Poilane is down the street and a heartbeat away for when I need my chausson aux pommes, croissant, or daily bread. 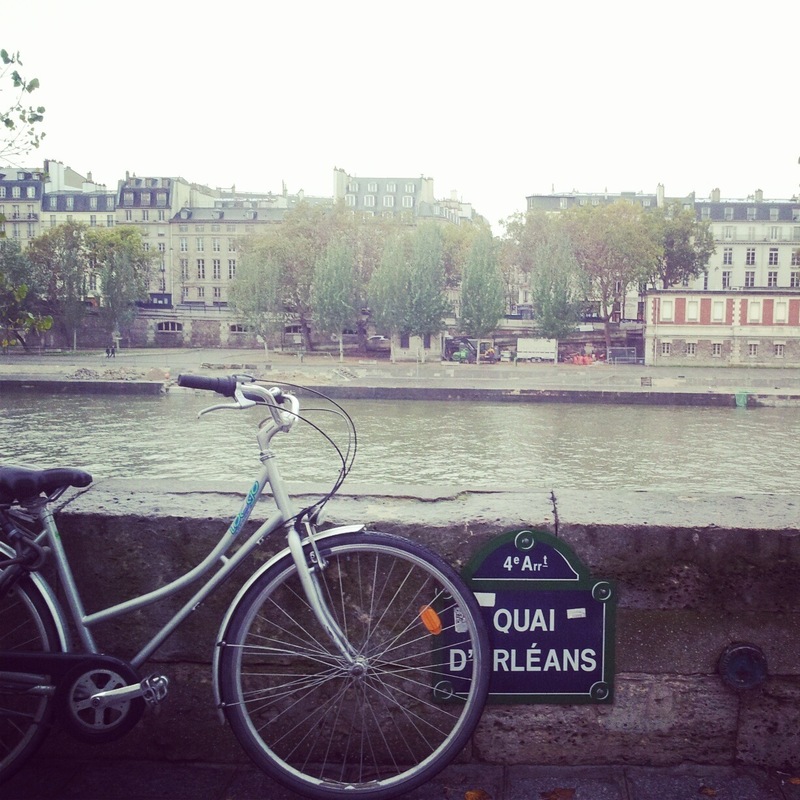 I was a bit afraid of whether or not living in the area could fulfill my concept of Paris. Paris is this idol in my mind and Flaubert wrote, “Il ne faut pas toucher aux idols, la dorure en reset aux mains.” [“Never touch your idols, the gilding comes off on your hands”]. I’ve never been good with following advice, and now have very gilded fingers.That said, while I love my area, I’m not confined to it. I ride my bike about 250km a week, and within 25 minutes by bike, I’m at Hippodrome du Longchamps to train with other cyclists or en route to Vallee de Chevruse or foret du Rambouillet for my “countryside” morning cycling rides. Even though I spend most my waking time outside of the 6eme, it’s always the perfect place to return to lay my head. Baudelaire was baptised in St. Sulpice. I was pleasantly surprised to learn that. Favourite here is a tie. I almost always dining out for dinner and my lifestyle generally dictates that I’m eating around 3-4000 calories a day. On any given day, you can probably find me at one of these: L’avant Comptoir: To be able to stand while eating and drinking incredible fare is a very simple pleasure for me. L’avant Comptoir celebrates its producers, both in food and wine. but they are never pompous about it. It doesn’t scream “VIN NATUREL! PRODUCER DRIVEN FOOD” like quite a few places in Paris right now. You go in; you quip; you eat; you drink; and repeat. You can point to the pictures of the food hanging on the cards draped from the ceiling, which serves as the menu. Plus, the guys behind the bar are great at pouring the right glass when you say something along the lines of “I want something that feels like a slap to my face and a love song to my liver.” The endless bread, butter, and mustard deserve praise as well. Conviviality reigns here. It’s a great spot as a recent transplant to Paris. Otherwise, you’ll find me at Cafe Trama. The marble top bar, a very limited but very well curated wine list, the consistent menu. I never really hear much English while I’m sitting in there and it’s always welcoming. Everytime I’m tempted by the beef tartare (beef from the amazing Butcher Hugo Desnoyer) and their chestnut cake. It’s a real struggle to order other items, but I’m never disappointed when I do. I’ve had the entire menu a few times over. It’s my little neighborhood food escape. That they’re closed on Sundays and Mondays kills me. Finally, the aforementioned Coutume Cafe. I’m here more often than anywhere else besides work. They do their coffee properly. It’s a grand cortado. They also facilitate my broken French and set me straight for my day. They basically pack a lunch for me and the folks there are always going beyond courtesy. For example, this past weekend, I rode the Ronde van Vlaanderen as a part of the sportive, the day before the pros race it for real. This is a 250km bike race designed to break your spirit over the stretches of cobbles, which are meant to clobber you. For my nutrition on this 9+ hour ride, I asked if the kitchen would make me some of their flapjacks in bulk. The chef found out why I was ordering and now has committed to researching the calories in them so I can track nutrition better while on the bike. How can you not love a place like that? 4. Are there any urban legends/historical trivia that you know about the area? I was told Charles de Bourbon, Count of Charolais, would carry out his debauchery around the area of St. Sulpice. This guy was a purely wicked, Sadean figure. It’s almost indecent to recount his lechery. 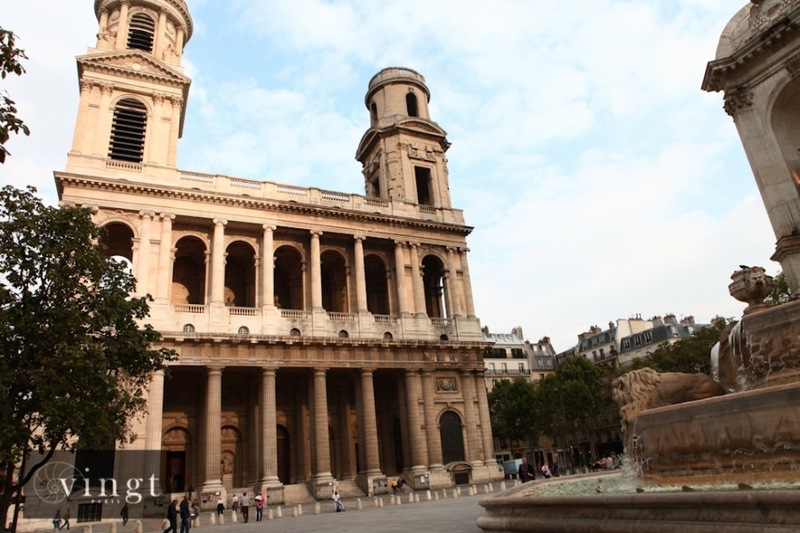 One of his many notorious incidents was said to have been carried out in the square in front of St. Sulpice. Now, whenever walking along Rue Saint Sulpice, you can see the outline of a sculpted man through one of the stained glass mirrors. He casts an ominous shadow on the glass. I have no idea who the figure is in actuality depicting, but I tell people it’s Charles De Bourbon caught right before one of his acts. Jean-Charles Rouchoux, Chocolatier. The truffes are decadent. At any given point in time, I have a little box of them on my person. Otherwise, Berluti is decadent fun. Bon Marche obviously. There’s a doll shop right across from Jardin de Luxembourg which I always find intriguing but haven’t gone inside yet. 6.What makes your area different/distinctive compared to other quartiers in Paris? It’s a bit of a melange wiith Montparnasse at one end and St. Germain-des-Près on the other. There’s always a high tourist rate, but almost two very different worlds, both looking for a Paris experience but in different paths. Right in the middle, around where I am, you get the sweet spot of residential, low-key, nice to be everyday kind of life. 7. How would you describe the people who live in the area? There’s a real gradient as you move along Rue de Rennes and Raspail. It doesn’t feel as dense as other parts of the city and you pretty quickly get an eye for who lives here and who’s passing through. It’s not a very ex-pat, immigrant, section of town so you still feel a very “rive gauche” vibe. 8. How has the area changed since you moved here? And then beg our absolutions for our daily trespasses and share in a shot of Fernet Branca. 10. 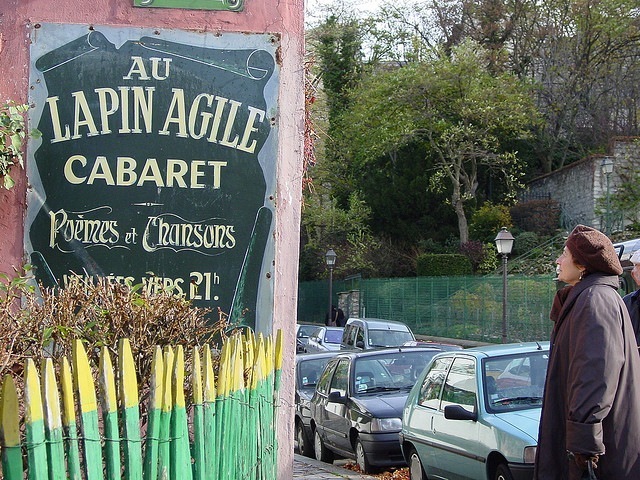 Describe an activity/place/walk/something you like doing in your quartier. Recently, I’ve taken to finding a table at a cafe along my street and bringing along a little sign “Voulez-vous prendre un cafe avec moi?” I’ve only done it once so far but the results were encouraging. Otherwise, you’ll find me front of St. Sulpice, contemplating by what good fortune it is I arrived to this moment in life where I can be standing there, in the middle of Paris, staring at St. Sulpice, drinking whatever bottle I’ve picked up from La Cremerie down the street.